A manufacturer of Soda Ash was struggling with production capability and product quality. 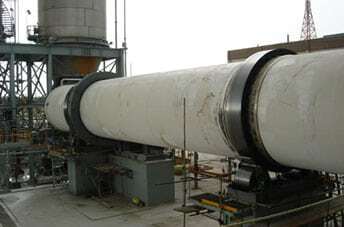 The aging dryers had lost critical heat transfer area because of repetitive tube leaks due to the loss of structural integrity of the shell and tube supports. 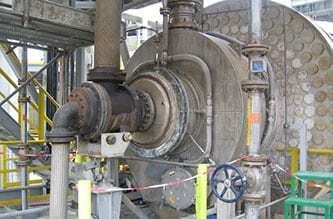 In addition to affecting the steam tubes, the excessive shell deflection had made it impossible to keep gas/product seals functioning, allowing critical process-generated gases to escape, and oxygen to infiltrate the system, slowing down the upstream process. The dryers had to be shut down and cleaned every few days. After a series of meetings with the client’s production, maintenance, and project engineering groups, LDC identified the problem areas of the existing equipment and custom engineered a solution that addressed both the structural and process issues. Due to the surrounding equipment configuration, there was no option for an increase in size. The existing equipment envelopes had to be maintained, so new LOUISVILLE Continuous Seal (CS) Steam Tube Dryers were engineered to fit back in place. The new dryers were structurally designed to handle heavy loads, frequently caused by process upset conditions. Designed to handle the heavier loads, LOUISVILLE’s no leak CS technology could be applied to ensure none of the critical process gases would escape, and no oxygen would leak into the dryers. The old dryers did not allow for the residual non-condensable gases to be vented from the steam tubes. These non-condensable gases would accumulate in the tubes and displace steam, causing a decrease in heat transfer and slowing the production rate. The new LOUISVILLE dryers incorporated a vent header system which allowed all of the non-condensable gases to be continuously discharged from the dryer, allowing the steam tubes to remain charged with steam, maximizing the dryers’ ability to effectively process material. One of the largest Wet Corn Milling plants in North America had multiple Steam Tube Dryers with broad swings in process rates as the dryers were operated between shutdowns. The dryers would start up and operate at design rate, but after a short period of time, would lose drying capability. The dryers also started having trunnion and tire wear problems, as well as frequent trunnion bearing and shaft failures. One of the dryers most critical to the operations was identified as a priority. LOUISVILLE Process Engineers met with the client’s production staff and observed the operation of this dryer. The dryer had a continuous discharge of water from the vent valves. The condensate return system appeared to be functional and properly designed. The dryer was tested by bypassing the condensate return and venting to atmosphere. After several hours of venting to atmosphere, the dryer was still spraying water from the vent valves. This clearly demonstrated a problem with the dryer’s ability to remove the volume of condensate generated in the drying process. Further discussions with the client found that the plant had been de-bottlenecked several times. 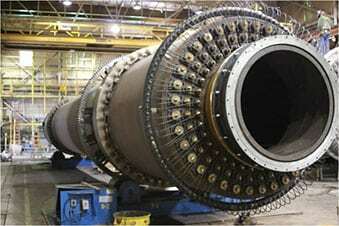 The dryer rotating speed and steam pressures had been increased to accommodate the higher rates. It was during one of these de-bottlenecking projects that the dryer operations had declined. LDC Process Engineers evaluated all of the process parameters and determined that while the dryer had a marginally adequate surface area to handle the higher throughput, the steam chest design did not. 1. The steam chest was an antiquated rotating siphon condensate discharge design. 2. There was no condensate sump, and therefore, no condensate surge capacity. 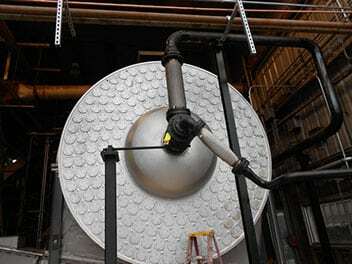 The rotating siphon condensate discharge design relies only on the available volume of the gravity flow condensate pipes in the steam chest that are all joined to an 8″ trifurcated pipe attached to the rotary joint. As the dryer’s rotational speed increased, its ability to remove condensate decreased. And when the condensate load was increased with the higher throughput, the dryer could not recover from the additional load. As the plant had grown, equipment had been placed all around and overtop of the dryer. It would take an impractical amount of time to shut down the process area to replace the existing dryer with a new one. LOUISVILLE Engineering was able to develop a redesign package for the dryer. The redesign used the existing shell, drive base, structural trunnion bases, and the feed and discharge housings. A new LOUISVILLE stationary siphon design High Flow Steam Chest and rotary joint was designed, which allowed an almost 25% increased condensate discharge rate than the old design steam chest, as well as a new tube pattern which increased the dryer’s surface area by 18%. New tubes and low shell stress tube supports were provided, as well as a new fluehead, vent header, larger tires and trunnions with large shafts and bearings designed to fit the existing bases. In cooperation with the plant maintenance and operations teams, LOUISVILLE Technicians created a field rebuild plan that allowed the process area to continue operations while they executed the project. The re-designed dryer was commissioned on schedule. The design rates were easily met and steadily maintained, with a lower steam pressure, which yielded a higher quality product. A large paper mill operation was running out of landfill availability for their waste sludge stream. Finding a way to dispose of the waste sludge was critical to the continuing production of the mill. Management investigated several different options and settled on a waste-to-energy system. As paper mills use steam throughout their process, it was decided to devise a way to convert the waste sludge into a boiler feedstock and generate steam that could be used within the plant. The mill was operating near the limits of their environmental permit so the waste-to-energy project needed to have a minimal emissions impact. Working with the mill’s project team, LOUISVILLE Process Engineers developed a Steam Tube Dryer system that dried the waste sludge to a moisture content and consistency that enabled it to be efficiently utilized as boiler fuel. The sweep gas from the dryer was sent to a condensing scrubber, where a high percentage of the water vapor from the drying process was condensed back to a liquid. The sweep air was then sent to the boiler as combustion air with the added benefit of VOC destruction, thus eliminating an odor generating point from the plant. The dried sludge being similar in BTU content to the biomass originally being used as boiler fuel, and the conditioned dryer off-gas stream used as boiler combustion air, created a minimal impact to the overall plant emissions. A global Petrochemical / Polymer producer had been operating a rotary steam tube reactor for almost 30 years. This reactor was a hybrid of a rotary Steam Tube Dryer with external shell steam tracing tubes as well as internal steam tubes. The process utilized liquids, solids, and gases which, when combined under pressure and temperature, drove a chemical reaction and created a polymer. The unit had been a continuing maintenance problem for a number of years, and its operational availability had declined such that the product demand could not be met. Operations wanted to replace the unit, but the original manufacturer had ceased operations years ago. LOUISVILLE Engineering staff met with the project team to discuss a fast track Reactor replacement timeline. The client had only general information on the existing unit. Once all of the process requirements were understood, a one day shutdown was scheduled so a LOUISVILLE Engineering team could access the equipment and obtain all of the critical dimensions required to design a replacement unit. The new unit had to maintain the same form fit and function as the original unit, however, many design enhancements were desired to reduce the amount of maintenance required with the original design, and in doing so, increase operational availability. A key to the success of the project was to improve the product / gas seals on both ends of the dryer. The reactant gas used in the process was very volatile, and any leakage endangered all personnel in the process area. The LOUISVILLE design simplified the product / gas seals and made them more effective. The tire and trunnion sizes were increased, and a new gear mounting design was implemented. Installation of the new reactor was overseen by LOUISVILLE Field Engineers, and the unit commissioned without any problems. Process rates were met within hours, and dryer generated foundation vibration that had been creating issues with equipment around the dryer were eliminated.